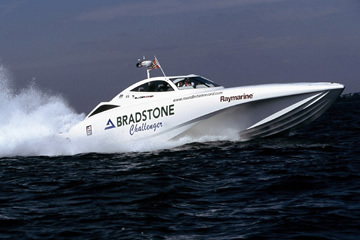 Built by ICE Marine (with partners Navatek) to take the Round Britain record, Bradstone achieved this in the summer of 2005. The first 51 foot Bladerunner AEM she was designed as a fast leisure craft rather than a low freeboard racer. She still managed to achieve a speed of 71 knots (82 mph), however, and circumnavigated Britain in 27 hours, 10 minutes.